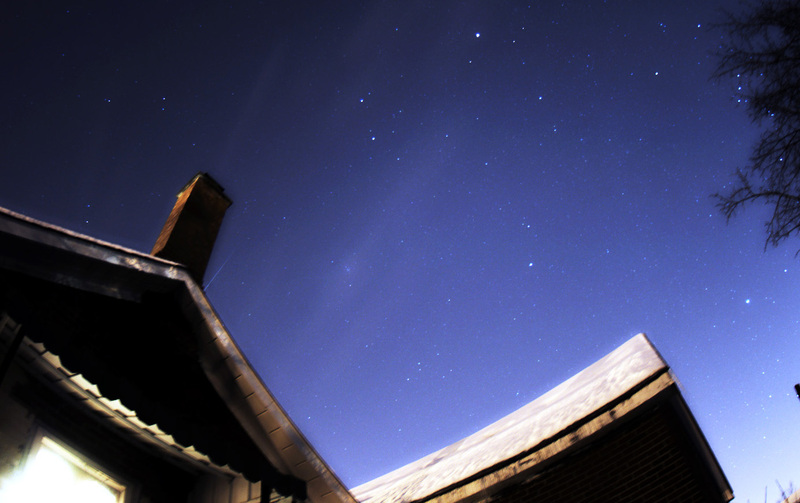 Photo details: Canon 350D, 8mm f/3.5 objective, ISO 400, 60 s exposure. 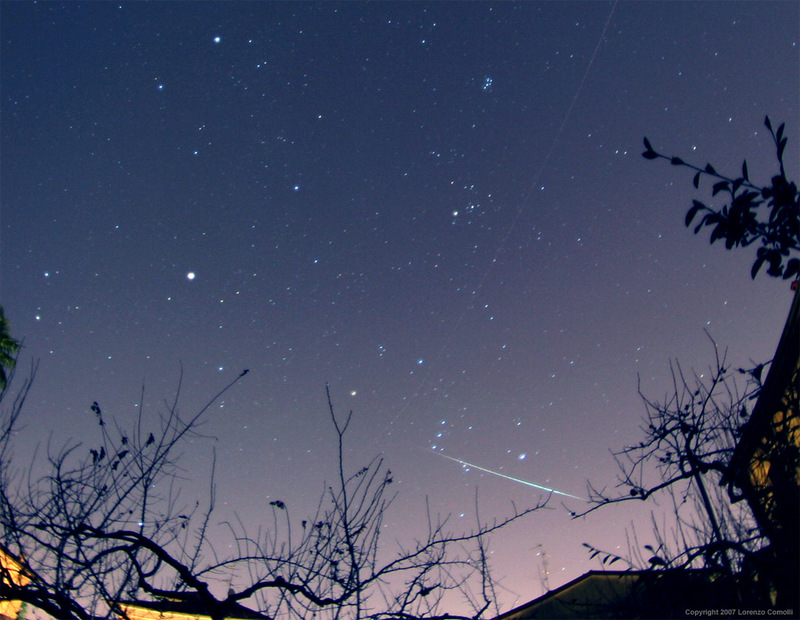 "Here is a movie--with stereo sound!--of an early Geminid fireball captured on December 13, 2007, at 0459 UT, a day before the peak of this year's shower. This spectrograph shows the radio signature of the meteor at 04:59 UT, (at the right of the chart.) I am recording forward scatter audio from two separate radios tuned to tv channel 3 and 6 video carrier waves.The top half of the chart is the radio reception at 61.250 MHz and the bottom half of the chart is the reception at 83.250 MHz. 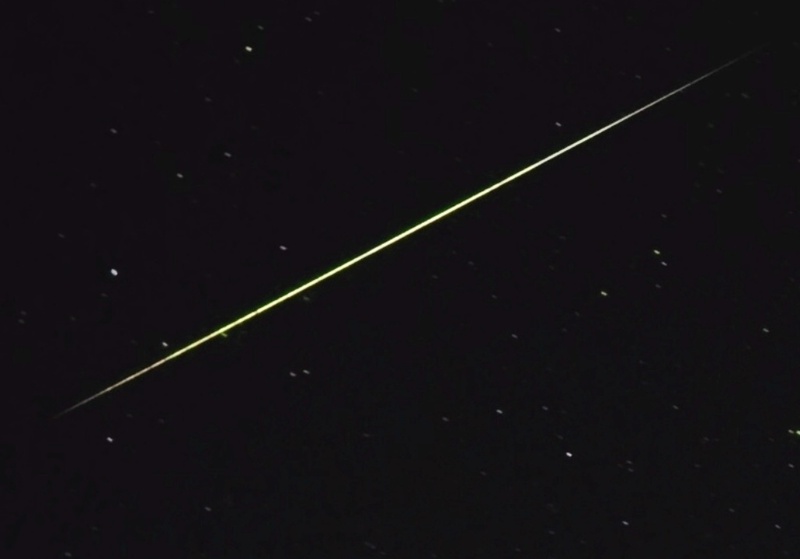 Listen close, with headphones if possible, and you will hear this fireball in stereo. 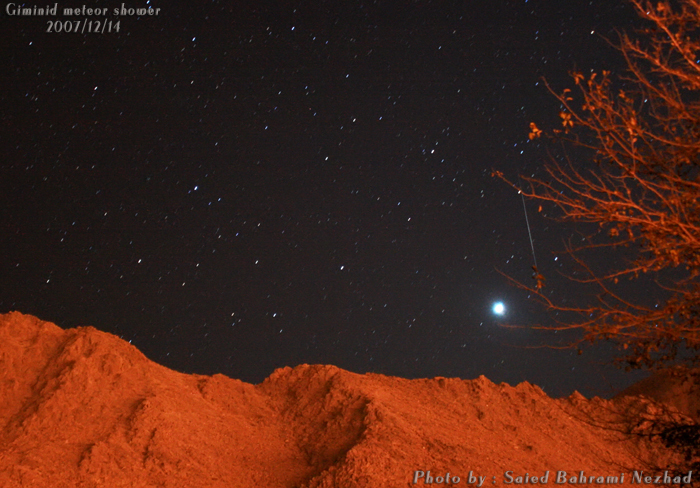 Before the sun rise when Iwas taking some photo frome Venus, suddenly I saw a really beautiful meteor which passed near that shining planet. 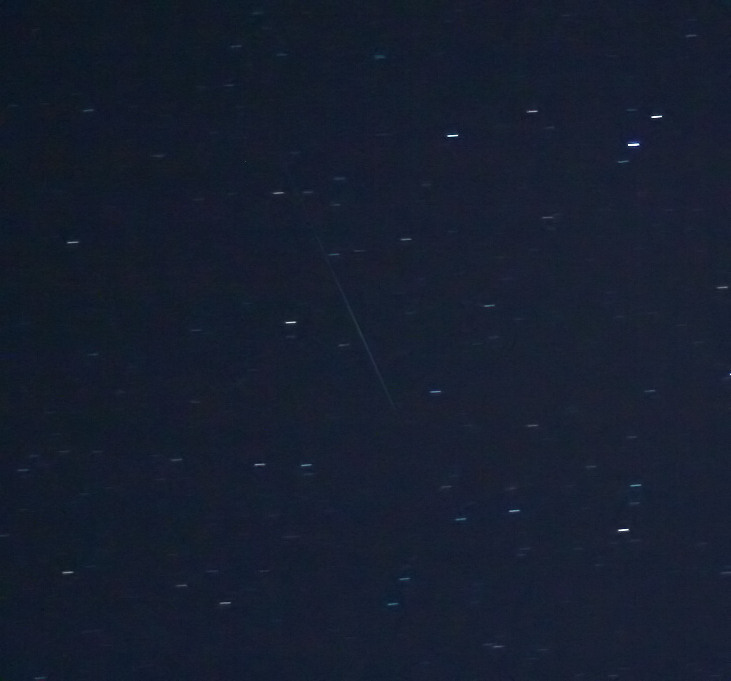 It was an enjoyble end for my Geminid meteor shower observation. 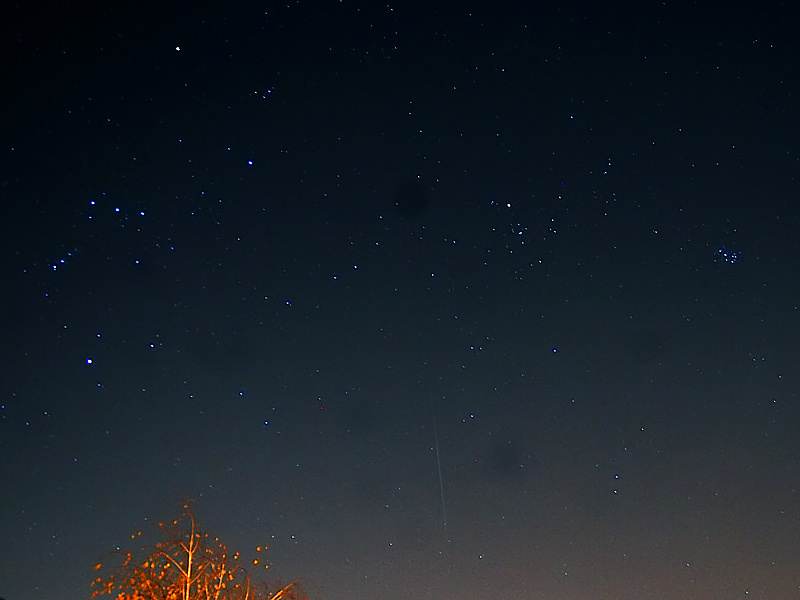 Tonight I've watched for an hour from my light polluted back yard for Geminids. 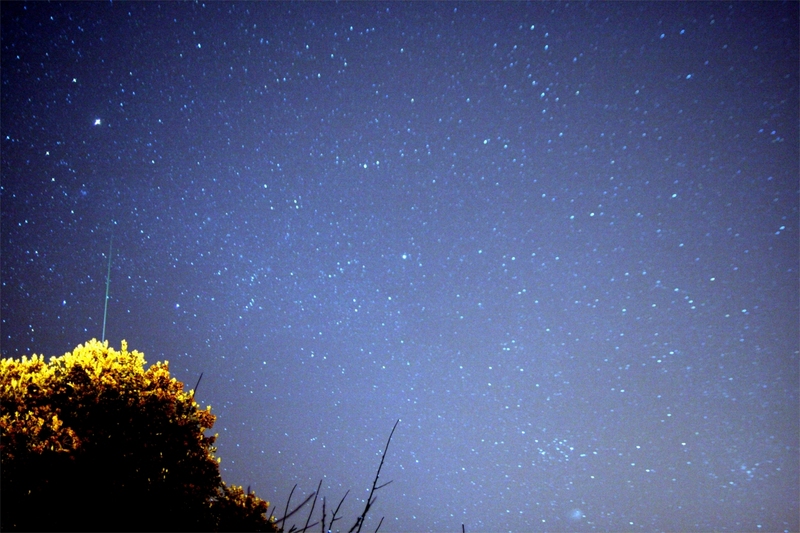 I saw 4 or 5 meteors. The one, which I captured was a very bright and long. Too bad a tree prohibited me to see him all the way through (How many times I've told my husband do not plant so many trees in our back yard). The comet is also at the image. Could you see her? Photo details: Canon XTI, 18 mm Sigma lens F1.8 ISO 800 for 15"
Since my local weather forecast is for clouds during the peak of the Geminids I decided to play the statistics and hope for an early glimpse of the meteor shower. So, I setup my camera to automatically take a 30 second exposure every 2 seconds for as long as my battery would last. Starting at 12:34 a.m. my one and only recording of a meteor occurred at 1:08 a.m.
Photo details: Nikon D200 camera, ISO 200, 30s exposure.